Those of you that know me, know that I photograph a ton of hip-hop and rap related events here in my hometown of Houston. We are known for our rich culture of hip-hop and rap, so much so that my alma-mater, the University of Houston recently put on a symposium devoted to Houston rap to pair with their exhibit of Houston-related hip-hop ephemera in the university’s library. This past Saturday was a 16-hour day filled with nothing but hip-hop related events. I started the day off around 11am at the annual Los Magnificos car show at Reliant Arena. Local artist, Doughbeezy and his manager Al, whom I graduated high school with, hooked me up with a backstage wristband for the day. I used to frequent these huge car shows years back and there were always entertainers, but this one, backed by a local radio station, has definitely grown into a huge concert inside of a car show. 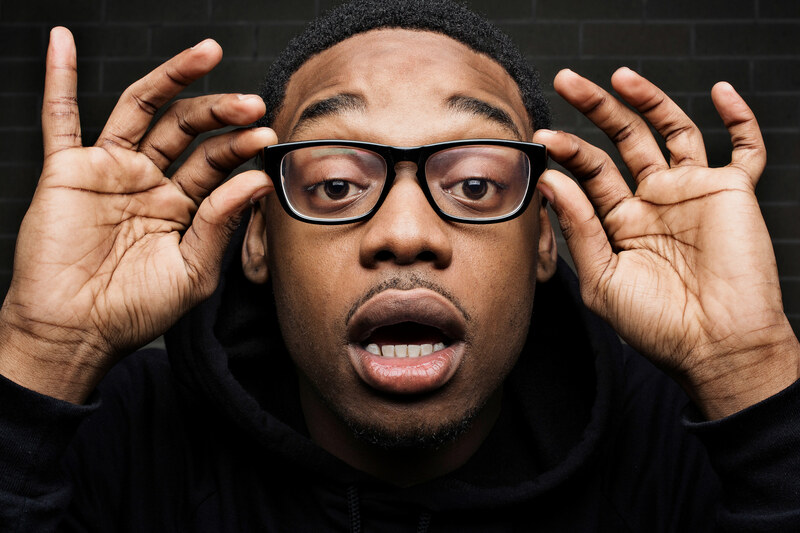 The fairly impressive lineup of hip-hop artists ranged from old school to new school. I was able to see Whodini perform their 1984 hits, “Friends” and “Freaks Come Out At Night” on the same stage as newer stars such as Tyga, J-Cole, and Future. Da Brat, Naughty by Nature, Chubb Rock and local favorites, Slim Thug, Z-Ro, Propain, and Doughbeezy performed as well. Although I had a blast watching the performances, I was frustrated at the show’s setup. Since the venue was essentially a huge/long building, the sound was terrible. Of course the stages had professional sound, but the acoustics of the building were so terrible that after several hours I had a huge headache from all the excess reverberation and echoing. Not only that, but there was limited stage access or front of stage access for photographers, so instead of making images per usual I just sat back and enjoyed the show. After regrouping at home for a bit, I hit the streets once again for a private music video shoot for “Long Live The Pimp” by Epic Recording artist and Atlanta native, Future. The song, off his recent release, Pluto, features Grand Hustle artist from Houston, Trae Tha Truth and pays homage to the late Pimp C of UGK. I didn’t get a lot of details prior to the shoot; there were no pre-production meetings and no call sheet. I got a text from friend and collaborator, Steven “Philly” Phillip, who was directing the video. Philly directs tons of music videos in the hip-hop industry and was flying in from Milwaukee for a few hours just to do this video. I agreed to meet him at a downtown address at 10pm. When I got downtown I noticed the location was a parking garage. After being waived up and driving to the top, instead of seeing 1 car with Trae and Philly inside I saw what is the Houston-equivalent of a scene from The Fast and The Furious, a slab line. 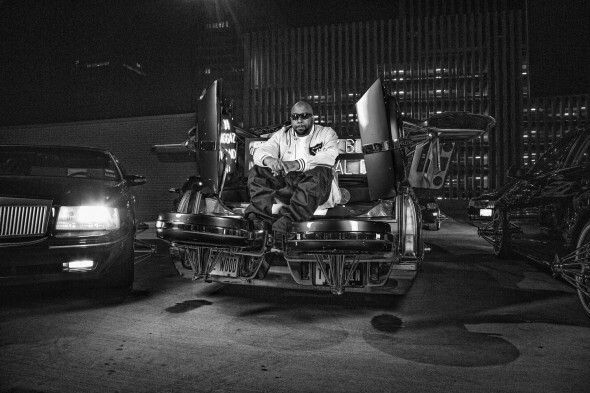 Custom cars is just another cog in the hip-hop culture machine of Houston. It’s a distinct set of things that makes Houston cars stand out and they are all things better experienced than understood. The top level of the garage was packed with 84’s, swangaz, elbows, neon, bass, and everything else needed to shoot a music video. They were ready. Even though these artists are fairly well known, (Future has half a million Twitter followers alone) there are real record labels involved and the resulting videos get millions of hits on YouTube, the production is usually very grass-roots. Within a matter of hours dozens of the city’s top cars are organized, the director flies in from halfway across the country with nothing but a backpack, I show up with my own gear, another friend of a friend who owns a studio shows up with some lights to use. There are no focus pullers, no trailers for the “stars”, no craft services and no PA’s holding walkie-talkies, but the end product is usually more impressive than videos with 100x the budget shot 10 years ago. Sure there are still music videos with huge budgets, actors, and permits, but there are also TONS of music videos being shot on literally no budget and still look amazing too. Years ago artists would shoot maybe 1 or 2 videos for their album’s singles. Nowadays artists will do a lot more videos in a short amount of time. It’s an interesting paradox; social media, YouTube, the dissemination and sharing of the content. It’s how a lot of artists get noticed, get their names out there and get seen. Whether we are better off with lots of lower budget productions or fewer high production features, who knows. When we arrived on the crowded parking garage, Philly got to work setting up lights for the video shoot and I took some time to set up a simple one-light still photo set that I kept off in a corner of the roof of the garage. 1 Profoto 7b with a Profoto medium box mounted was all I needed. I wanted to do some informal portraits of the artists in between takes. I work with Trae pretty closely, but had never worked with Future. I had no idea what I would get, if anything, but I wanted to be ready. Trae takes a break on a car in-between takes. After setting up stuff, I walked back over to the main video set. Philly was about ready to start shooting. I play the role as “associate producer” or similar; help him with shots, angles, gear, lighting, etc. While he captures video of the performance scenes, I snap behind the scenes stills. I also took several of the different cars setting up. Some of the displays of neon were pretty interesting. The above is an image I liked of Trae taking a break before shooting his solo performance scene. After Future was finished shooting his scenes I was able to get him alone for a few frames at my setup. Luckily Lil Corey, Pimp C’s son, came over and helped me test my lights so they were nailed by the time Future came over. Future was definitely nice and into it, but since he was feeling a bit under the weather I only got a few minutes in. Below are a few of my favorites from my short time with him. A triptych of portraits I made during my 5 minutes with Future. After the main scenes were shot with Trae, Future and the cars Philly moved on to cameos. Cameos are a huge part of rap videos. Your homies get screen time, what’s better than that? Members of both artist’s camps including Slim Thug and Z-Ro made appearances. Although I don’t think she had an on-screen cameo, I was glad to finally meet Julia Beverly of Ozone Magazine fame. As the cars were starting to file out and the video lights were being struck, Spank D, one of Trae’s good friends and an artist in his own right, came over and wanted to shoot some photos with Spodee, a fairly new artist who signed to Grand Hustle records. I’ve photographed Spank several times before and he is always hilariously animated so I obliged, no question. I had just met Spodee, but within seconds of them in front of the camera I knew why they were friends. They were hilarious, instantly busting into different poses and having a great time. I made several of Spodee solo, including several where he insisted on wearing my glasses. I’m pretty proud of the portrait I made while blind! 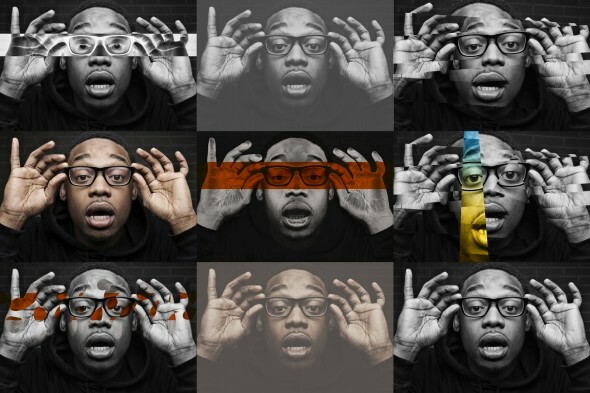 During the editing process I allowed myself to get a little creative in Photoshop with one of his frames. I used to get creative and not save the more out-there edits, but I’m making a point of doing that now. Even if some are a little TOO crazy and will never see the light of day, I like saving them just because. Below is a collage of some of the edits I saved. Sometimes I like to get a little extra creative in Photoshop. Spodee / Grand Hustle. After the session with Spank and Spodee, Trae, Philly and I left downtown and shot a few more scenes with just Trae. After those, Philly and I filmed some downtown b-roll before calling it a night. I drove Philly to the airport at around 4am. He was getting ready to fly back to Milwaukee after only 6 or so hours in Houston and I was wrapping up an extra-long day. The hip-hop game in Houston doesn’t sleep, but I definitely needed to. If you would like to purchase a print or license any of the images included in this post, please email me at info@toddspoth.com. Stay tuned to my Instagram, Twitter and Facebook feeds for an update on the music video. 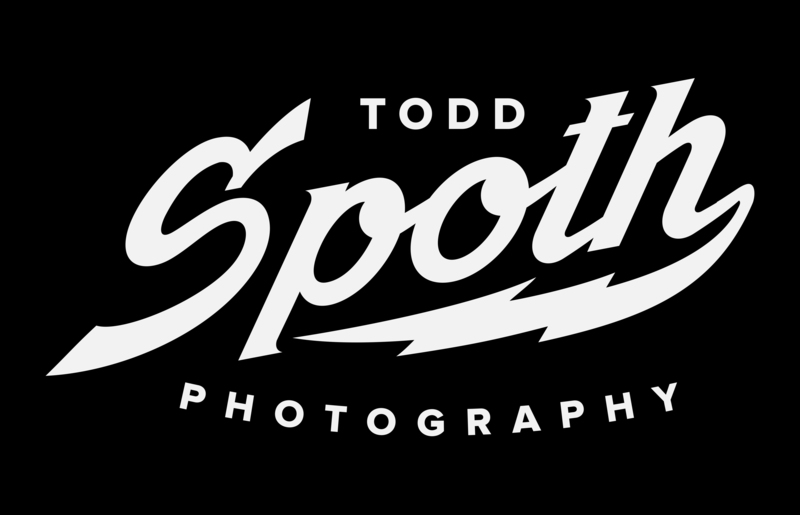 I’m @toddspoth on all networks. Also, let me know what you think and share with friends!